THERE is a wide measure of agreement among historians and social scientists that political pressure from the working class was one of the main reasons for the origins of social reform. 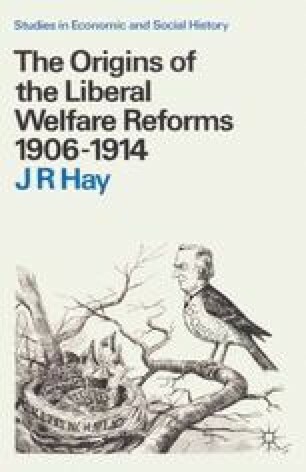 Politicians introduced social reform either to attract electoral popularity or to prevent workers turning to extreme labour, socialist or syndicalist solutions. The latter part of this explanation seems to fit Bismarckian Germany, but both elements have been applied to Britain. T. H. Marshall, for example, traced a progression from civil to political and then to social rights in which he emphasised both popular demand and what he called the ‘class abatement’ aspects [Marshall, 1963]. Contemporary writers, like Sidney Webb, also saw collectivism as ‘the economic obverse of democracy’. As he said, ‘if you allow the tramway conductor to vote he will not forever be satisfied with exercising that vote over such matters as the appointment of the Ambassador to Paris…but…he will…seek…to…obtain some kind of control as a voter over the conditions under which he lives’ [quoted in Gilbert, 1966, 25–6].